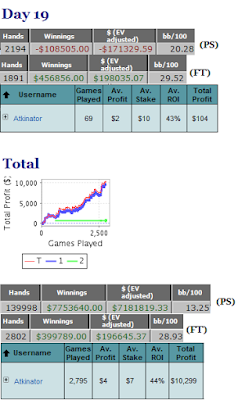 I am quite an avid watcher of televised poker, as I have blogged about before. I download episodes of poker shows from PokerBay and watch them on my TV thanks to my WDTV Live box. Recently I have been watching the brand new PokerStars.net Big Game, and I have to say I've been enjoying it so far. In some ways it is similar to Poker After Dark, in that each table is broadcast over 5 episodes, and the game 6-max format. However there are many differences that make it a much more interesting show. It is a Cash Game with $200/400 (100) blinds, similar to High Stakes Poker (which has $300/600 (100) format). The commentary team of Chris Rose and Joe Stapleton. I listen to Joe Stapleton quite a lot on the PokerRoad Radio and The Poker Beat podcasts and he is a very funny dude, and the banter between the two commentators mean it is more like the Lon Mcherron/Norman Chad (which I like) and Gabe Kaplan/AJ Benza (which I miss) partnerships, than the lone commentary teams of Ali Nejad or Gabe Kaplan, which I think makes it more entertaining. The "Loose Cannon" element. This creates such a different dynamic for the show, as these online qualifiers only keep any profit they make, which will usually force their action at some point. I think the show somewhat relies on the Loose Cannon being a competent player, as it was much more interesting watching professional online grinder Will Davis in week 2, than the complete donk Ernest Wiggins in week 1. Perhaps that's because I enjoyed watching someone who is similar to myself take on the big-boys and do well. Of course it was the good player that went bust (getting his money in good) and the donk that made $50k (after running a hand where he was a 9% dog four times, and somehow winning three of them in Andrew Robl-esque fashion...see below). Yesterday's session was somewhat experimental, as I attempted to play both PokerStars 180-mans and Full Tilt 90-mans at the same time. It was also unsuccessful, as trying to handle both sets of tables ended up being so stressful that I ended my session early. I didn't play great and it seemed like I ran pretty bad so was pleased to at least break even. I believe I have found a way to make playing on both sites since that session, so I will be trying it again today and hopefully it will work out much better. 2 Comments to "My thoughts on the PokerStars.net Big Game"
I hate Robl, hate him! Seeing him in that video makes me want to glass him! I think it stems from his old blog, the Ship It Holla Ballas or whatever it was called. He's everything that is wrong with poker players and he sounds like a complete tard too!